Live bands, DJs, pop-up fashion shows, art-making in the streets, dance and theater performances, and art exhibitions are among the many highlights at Manifest. 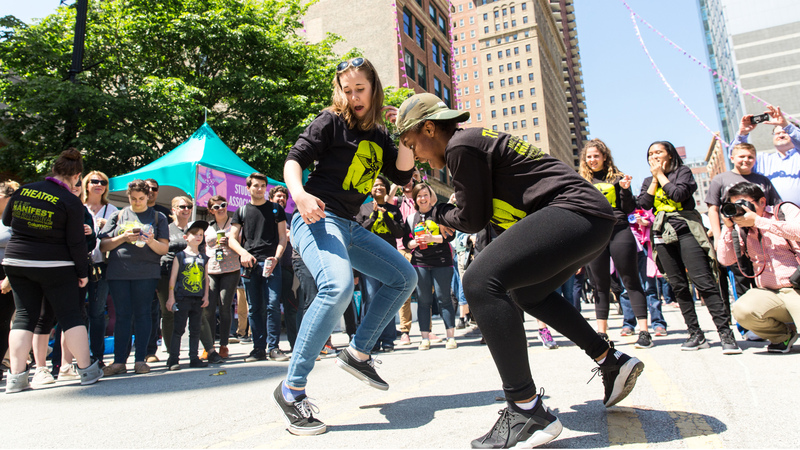 Billed as the largest student-run arts festival, the event celebrates the creative work of more than 2,000 Columbia College Chicago students. Festival season means sipping, shopping and strolling alfresco. Do all three – and then some – at the Renegade Craft Fair. The spring edition on Mother’s Day weekend features goods from emerging and established makers, local DJs, workshops, food trucks and more. Rain or shine. Check out more of the season’s upcoming festivals in our 2018 Chicago Summer Festival Guide. Immerse yourself in a day of performances and workshops celebrating the contributions of Mexican and Mexican-American artists and designers in Chicago at Arte Diseno Xicago: A Neighborhood Fiesta in the Heart of Pilsen. Go on a neighborhood mural hunt, create puppets, snap selfies and listen to live music. Browse goods from more than 20 pop-up shops from fair trade businesses, watch an ethical fashion show, and hear from international speakers at A Magnificent Mile of Fair Trade: Chicago’s World Fair Trade Day Celebration. Among the featured works will be products by Local Women’s Handicrafts. Check out Chicago Tonight’s story on LWH’s founder. Ever wondered what it’s like to live in a tiny house? Find out at the 2018 Chicago Tiny Home Show, where you can explore more than 20 tiny homes on display and hear from tiny home builders and dwellers. Threats of nuclear war, climate change and growing tensions between nations were among the reasons why the Bulletin of the Atomic Scientists moved the Doomsday Clock closer to midnight. A new exhibit, “It is two minutes to midnight,” presents a virtual reality experience inspired by the iconic Doomsday Clock. Learn about eco-friendly practices to benefit your home and the community at the Lake County Forest Preserves’ Native Plant Sale. Native wildflowers, grasses, shrubs, vines and trees will be available for purchase, as well as compost bins and rain barrels, while supplies last. Plays about love, loss, family, prejudices and politics from international playwrights are staged at the ninth annual International Voices Project. This year’s engagement features plays from Poland, Germany, French Canada and Syria. Portraits of Cleopatra, George Washington and Karen Carpenter are among the more than 30 paintings displayed in the exhibit “Stephen Warde Anderson: Attention to Detail.” The artist’s first solo show closes Sunday. Want to know more about the man behind the work? Check out Chicago Tonight’s story on him.